In contemporary interior designs, concrete is no longer relegated to floors, walls and ceilings, but has already made the transition to countertops and furniture. It also crossed with confidence into the realm of accent pieces, with the surprising effect of warming up the space, despite its coarse appearance. It’s maybe because of its texture, never exactly the same. It’s perhaps its weight, that asks to be noticed. 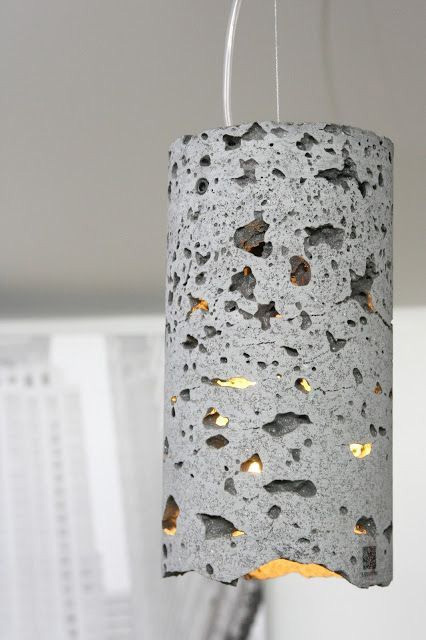 When it comes to concrete light fixtures, however, it’s the element of contrast between its raw texture and the ethereal consistency of light. This combination brings in the element of surprise that gives a jolt of life to a space in need of character. 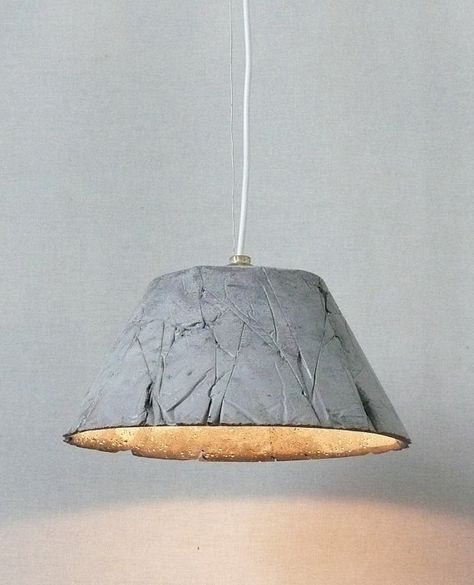 But concrete light fixtures have other qualities that may convince you to consider them. Here is, for instance, a bell-shaped pendant light created by the Bavarian designer Stefan Gant. Its body embraces a geometrical design in which straight angles mix with unexpected curves, rarely associated with concrete structures. The opaque lampshade blocks and directs the light, helping build the visual focus around the elements you choose. The designer had the additional idea to add a layer of gold, contrasting two materials – one raw, one sophisticated – and giving the light a warm glow. 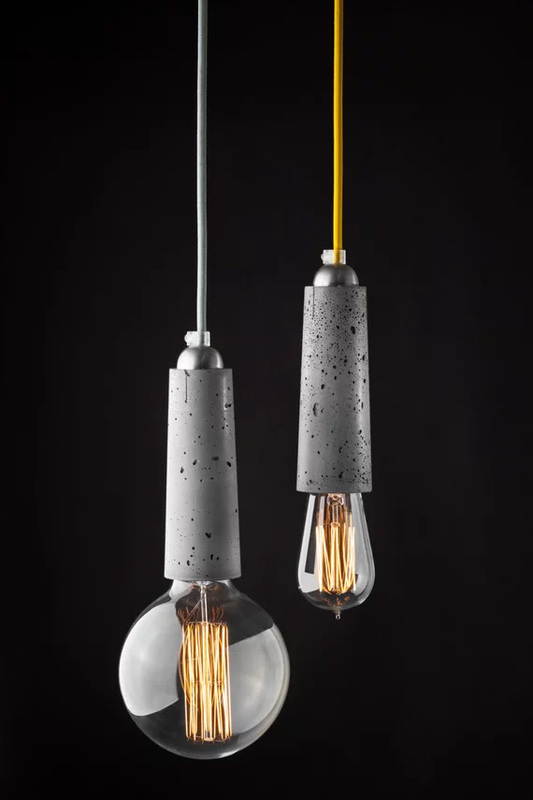 The Falcone concrete light is a perfect example of industrial design that achieves an unexpected elegance. Combining a concrete base with the transparency of glass and the appeal of vintage light bulbs, the Falcone pendant light is paired with colorful cords. If usually the lampshade is the star of the show and the cord the backstage actor, here the roles are reversed. It is the neutral tones of the concrete that allows you to play with the colors of the cords, especially when creating configurations of multiple Falcone lamps. Catherina 30 Wrinkles concrete pending light celebrates the rough texture of this material making it part of its appeal. Retaining the classic shape of a traditional lampshade, it improves on it with irregular grooves and fissures that emphasize its imperfections and make it look more alive. 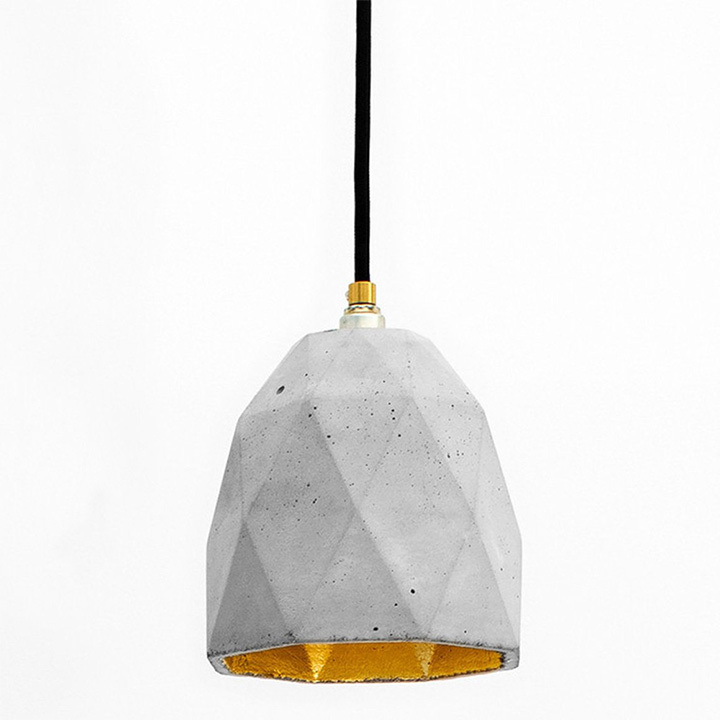 Concrete light fixtures, however, can look extraordinarily polished, like Lucifero’s ZERO51 pendant light below. Made of lightweight fiber concrete with concrete hand-crafted finishing, this piece has a sharp, minimalist design that feels at home in office spaces and modern commercial venues. A white diffusing screen makes it look finished and clean, while filtering the light and softening the glare. 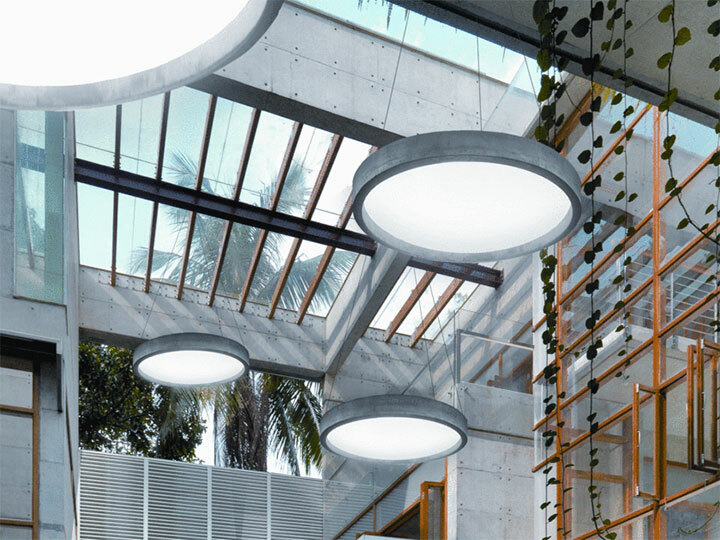 When concrete light fixtures are designed to play with the light, the result may be spectacular. The one below allows it to escape in little flickers through its irregular crevices, evoking the image of an inhabited object. This pairing of shy twinkles with the rough texture of concrete makes other design details unnecessary. Despite its simple cylindrical shape, the shade boasts with character.